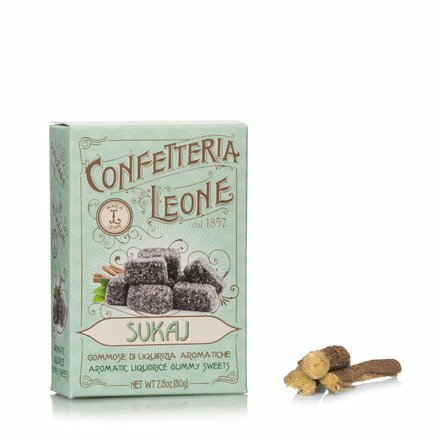 The sukaj confections made by Leone are one of the most well known and loved gums, thanks also to their ability to take us back to our childhood days. Made exclusively with the finest ingredients, Leone sukaj gums contain liquorice, gum arabic and essential oil of sweet oranges, which gives this sweet truly distinctive flavour. These are the perfect sweets for those quiet moments when rediscover the sensations of childhood. Ingredients Kordofan gum arabic, sugar, glucose syrup, liquorice juice, aromatic herb essences, flavourings. Colouring agent: charcoal. For more information on product labels, please contact our Customer Service department. The information on the labels of the products may vary for reasons beyond our control, therefore, there may be discrepancies between the information on the site and that on the products delivered. Please always check the information on the product before consumption or use.